In this edition of the Humanitarian Blog–the first of a three-part series on Fostering Refugee Livelihood by Empowering Host Community–we traveled to Adıyaman, Turkey, to meet with the owners of Olimpiyat Spor Gym, Mustafa küçükkaya and Ömer Dicle, who have offered a lifetime gym membership to the young Syrian refugee, Mohammed. When Ömer Yavuz, an associate at Olimpiyat Spor gym in South Eastern Turkish city of Adıyaman, published on his Instagram account a mobile-phone photo he took of a young Syrian shoe shiner boy, who was gazing dreamily into the gym’s glass window, neither Yavuz nor the boy had a preconception as to how powerful the message from the image would have touched people who saw it. …life-time membership to the gym would be offered to the boy in the photo. 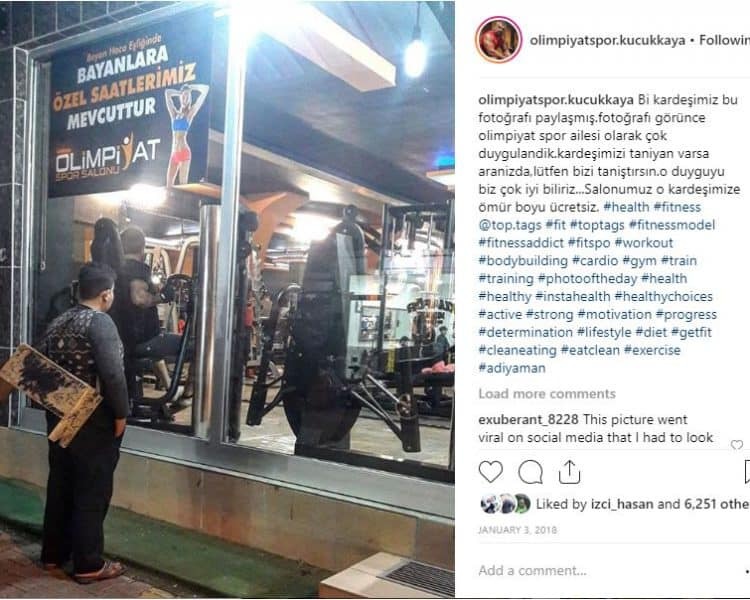 The Instagram image was re-posted with a brief message by one of the gym owners, Mr. Mustafa Küçükkaya, announcing that a life-time membership to the gym would be offered free of charge to the boy in the photo. To this effect, the post was hit with thousands of views in just a few hours. 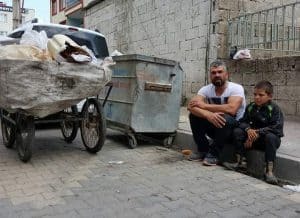 Mr. Küçükkaya talked to Earth International Foundation during the interview in December 2018, that people throughout Turkey had contacted the gym management to inquire about Mohammed’s well being–the Syrian boy seen in the photo with a shoe-shining box strapped to his shoulders. Many had offered to donate food and clothes, which Olimpiyat Spor managed to distribute. The unintended humanitarian cause inspired by Olimpiyat establishment had generated out-pouring supports for the young boy marginalized by war. But most importantly, it gave rise to hope, so often in Syria it was almost dimmed out of this boy’s life. Though for aid agencies administering assistance to marginalized populations, this hope offers a glimpse of new vision for refugee livelihood program design. The engagement that the society has with the Syrian boy, as inspired by Mr. Küçükkaya, is astounding not only because it has helped the boy to meet his basic human needs. But as a respectable member of the host country, Mr. Küçükkaya has influenced his community to look beyond stereotypical label stigmatizing the needy boy as a refugee. Be it as it may, livelihood development for refugee population requires willing cooperation from members of the host country (to this extent, Turkey as a country has done exuberantly well to shoulder the burden of hosting over 3.5 million displaced persons inside its border). Instead of translating livelihood development as income-generation…What could have been done differently is to cultivate “human capital”. The latter would also require “soft approach” …to anchor ‘change’…for the betterment of sustainable outcomes. However, should a livelihood development project be defined merely on an aspect of income generation–of the demand and supply side–which is still often done so in today’s development organizations, and leaving out “the holistic aspect of engaging host-country members” off the equation, investments in refugee capacity development would likely sink in vain. In this instance, the shelf-life of program sustainability could last so long as programmatic budget is still being utilized. The reality is that the annual budget will run out. Furthermore, funding for refugee livelihood will get even more scarce in present political climate. Therefore, instead of translating livelihood development merely as income-generation, what could have been done differently in implementing the program, which is still very much invisible by program design, is to cultivate “human capital”, allowing innovation and change at the grass-root level to have a potent effect in fostering and self-sustaining its own livelihood. The latter would also require “soft approach” in addition to “hard programmatic management” to anchor ‘change’ for the betterment of sustainable outcomes. …INGOs providing education aid to refugee children from Myanmar have been known to openly ignore the needs of host-country children who walk without shoes to the same school as their refugee counterparts. On the contrary, as frequently witnessed, organizations assisting marginalized populations tend to do the opposite for those outside their target groups. In South East Asia, INGOs providing education aid to refugee children from Myanmar have been known to openly ignore the needs of host-country children who walk without shoes to the same school as their refugee counterparts. When asked, the program director reasoned that the mandate did not describe host-country children as the target beneficiaries. Disparity espoused from program mandate as such would not render well to implore any host country for intrinsic cooperation. Nor does it follow “Do-No-Harm” approach, the modus operandi to which non-profit and humanitarian organizations alike should adhere. How then should host-country members: i.e. community leaders; local business operators; and local Government sectors; etc., be engaged and empowered to inspire social change at grass-root level? What Olimpiyat Spor has achieved to inspire change should serve at the least as a model from which it could lead a program design to a realized strategy for growing human-capital. Why “soft approach” matters in transformation change particularly in the context of Refugee Livelihood, and what it actually is, is a theory drawn from a number of change-studies undertaken by Earth International Foundation. To simplify the complexity of the subject, let us illustrate a case from the real world observed from Mr. Mustafa Küçükkaya as a change-agent. …a community has culture inherited over time. This culture is unique from that of an organization. Any ‘change’ introduced to the community based on organization’s mandate could be resisted if it is perceived as a threat in any form. First of all, a community has culture inherited over time. This culture is unique from that of an organization. Any ‘change’ introduced to the community based on organization’s mandate could be resisted if it is perceived as a threat in any form. Therefore, assigning the role of influencing actor (change-agent) to advocate for the cause of refugee livelihood development at the level of local community should not be the same as recruiting a staff member working under organization’s mandate. By asserting soft-approach at this stage is to have a feedback loop coming from the actor(s) within the community who informs change process to the program design. This feedback loop must remain open throughout the design and implementation process. Moreover, program design must be susceptible to the informed change. Our intimate observation from the interview and the time spent with Mr. Mustafa Küçükkaya reinforces our belief: that social change is gradual. Successful change evolves and transforms over a time period. The transformation is complex, organic and often takes on unintended approach different from what was firstly planned. As a result, before change momentum gains traction, incremental change is likely to be adaptive. While it might appear as if the change instigated by Mr. Mustafa Küçükkaya leaped rapidly judging from the visibility of the Instagram post, which went viral in a few hours. However, as we deciphered his trait as the change influencing actor, specifically in relation to the keyword ‘trust’, it is believed that, the visible ‘fad’ of the viral Instagram post has inherited root strongly linked to how his personal-professional-intertwining life in the community has been deeply perceived. The assumption is evidenced by the observation of Mr. Mustafa Küçükkaya’s interactions with his community– we followed him from the marketplace, to the café and tea-shop and to the restaurant, and with bystanders on public streets. There seemed to be a strong degree of congruence in Mr. Mustafa Küçükkaya’s communication pattern as he interacted with people from all walks of life–what he thinks, says and does are in alignment across the spectrum of his daily activities. Mr. Mustafa Küçükkaya told us about his rough childhood as he was growing up. Having to work odd jobs as a young child, he sympathized with the Syrian boy in the photo–it reminded him of himself as a child, he said. Despite the challenges life threw at him in childhood, Mustafa Küçükkaya learned to adapt his inner strength to his advantage. Mr. Mustafa Küçükkaya’s trait has won him the community’s hearts and minds. His soft skills, which he uses well in communicating to people, has a clarity. It reflects the value mostly appreciated by the Adıyaman people–that life is a gift. 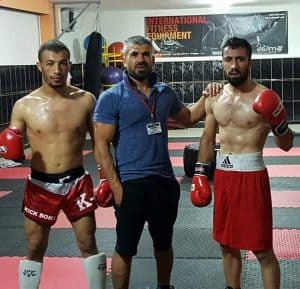 As a fighter who refuses to give up, Mr. Mustafa Küçükkaya, while in his 40s, still puts on the boxing gloves to train, and if an opportunity prevails, he gets on the ring to fight. Perhaps for Mustafa Küçükkaya, there is no distinction between what he does for business and in personal life–hence the congruence. On humanitarian cause, and in addition to Mohammed, the Syrian Shoe Shiner whom Mr. Küçükkaya has helped with physical training and encouraged him to go back to school, Mr. Küçükkaya has also hosted a number of less advantaged students from overseas while pursuing their studies in Turkey. Therefore, it is no surprise to us as to why Mr. Mustafa Küçükkaya’s trait has won him the community’s hearts and minds. His soft skills, which he uses well in communicating to people, has a clarity. It reflects the value mostly appreciated by the Adıyaman people–that life is a gift. We change the paradigm from in-dignifying the refugees through organization’s programmatic budget and donations, to dignifying them through a self-supportive paradigm. Inclusively, if the vision is drawn from community’s participation as the program design is being formulated, we can assure that there should be an intrinsic buy-in, which will make the change stick. Furthermore, by instilling the concept of “human capital” as opposed to de facto ‘hard-resources’, we foster the sustainability of the program by enabling it to rely on the innovation and change created by the people within the community–which include the refugees themselves and the community hosting them. By doing so, we change operation paradigm from in-dignifying the refugees through organization’s programmatic budget and donations, to dignifying them through a self-supportive paradigm. The only probability to understand comprehensively the community and its situation where the implementation of the program will take place is through direct program implementation with “tacit knowledge” deeply stored in the “cognitive map” of an entrusted and qualified community influencing actor in lieu of organization’s management. Yet, whether the program will evolve healthily, if all the above are met, still relies on factors transcending the conduciveness to the environment under which the program operates. These factors could be broadly analyzed in terms of political-economic environment, technological advancement within the location, and the legality of the environment, etc. It is also possible that, there already is a copy of such analysis performed specifically for the focused environment available on the internet under the search tag “PESTEL”. But we are quite certain that, there would not be an analysis that will provide a precise calculated scenario for a precise remedy to a specific conundrum in refugee livelihood development. The only probability to understand comprehensively the community and its situation where the implementation of the program will take place is through direct program implementation with “tacit knowledge” deeply stored in the “cognitive map” of an entrusted and qualified community influencing actor in lieu of organization’s management. In the next edition of this Humanitarian Blog, our discussion will provide an insight on how to avoid the quandary between organization’s mandate and cultural baggage both within the organisation’s context and the community’s where the program is introduced. Please let us know what you think by commenting directly below in Disqus.